April was a busy month and I wanted to share with you a look back at some photo highlights. Working on behalf of the constituents of the First District is always my top priority in Congress. 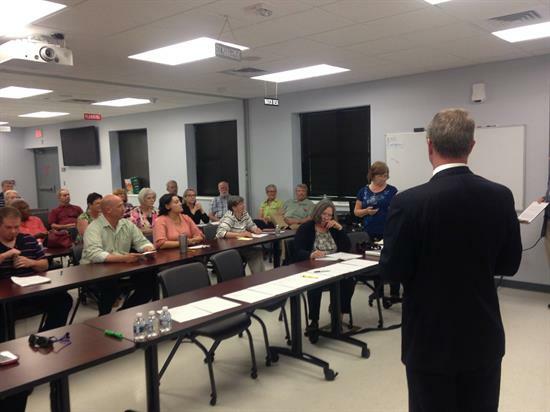 This month I held seven forums all across the First District to hear directly from constituents. Above is the great crowd at my Middle Peninsula round table where I answered questions about the critical issues facing the nation. The two pictures above are forums I held with constituent groups in Williamsburg/James City County (Top) and Essex County (Bottom). We had lively discussions about my views on health care, education, the environment, and immigration. 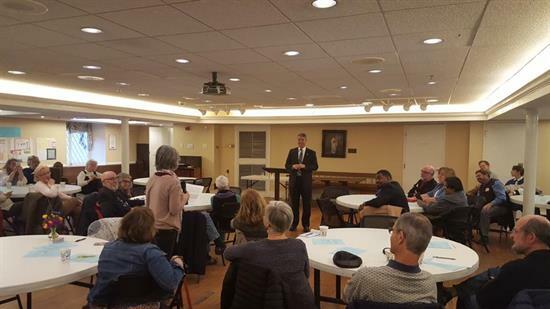 I met with constituents of the Beloved Community group in Fredericksburg at St. George's Church. We discussed issues ranging from our environment, immigration, health care, and the budget. 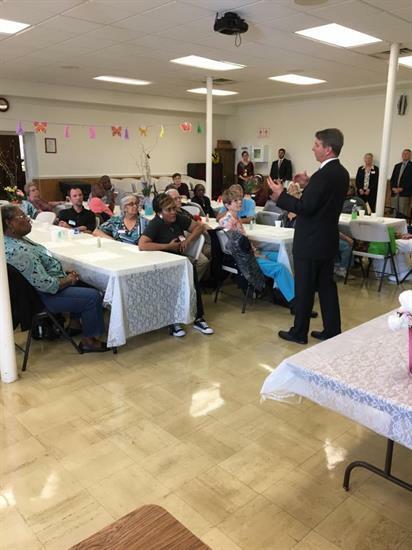 I visited with employees of Life Care and members of the community in Fredericksburg to discuss ways to improve our health care system and other issues before Congress. 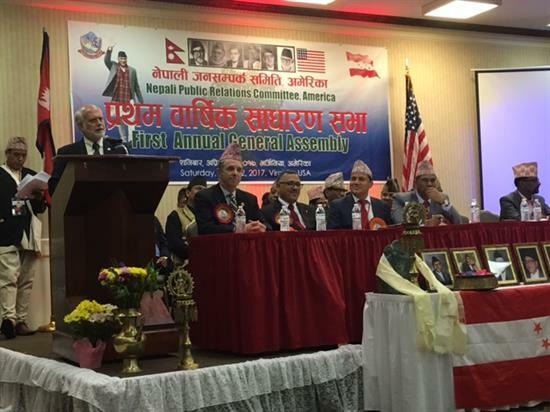 I attended the Nepali Public Relation Committee Virginia Chapter's Annual General Assembly meeting in Manassas. The committee promotes democracy, represents Nepali-American community and advocates strengthening the friendly US-Nepal bilateral relationship. We discussed the importance of global democracy and community-owned small businesses. 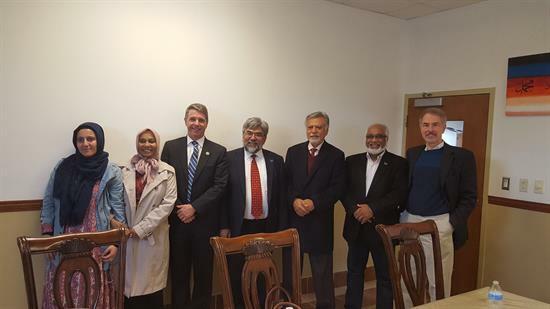 I met with leaders of Dar al Noor Mosque Center in Manassas and spoke at daily prayer about issues affecting all Virginians. I made it a point to visit our local schools to interact with students and also hear from teachers and administrators about how federal education policy is affecting them at the local level. 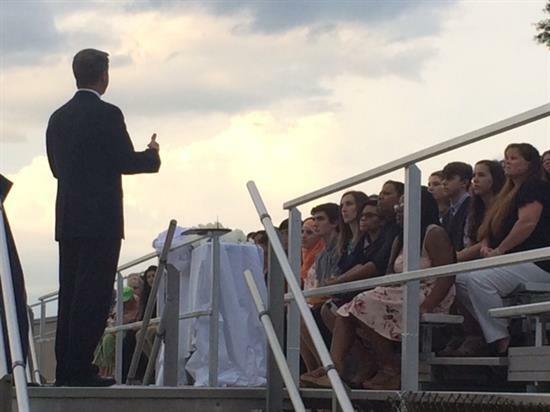 These are government students at Washington and Lee High School in Westmoreland County. 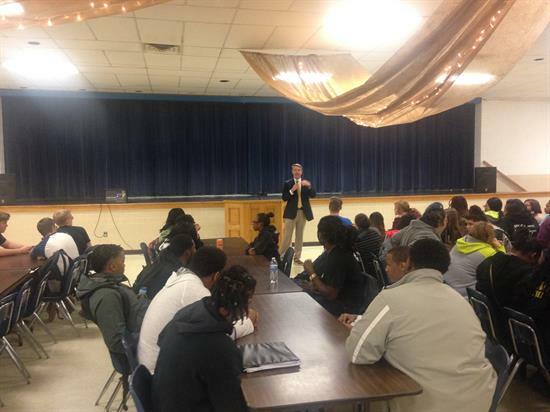 I talked with the class about what I do as a Member of the House of Representatives and what we can do as a legislative body to help our youth succeed as they prepare for their careers. 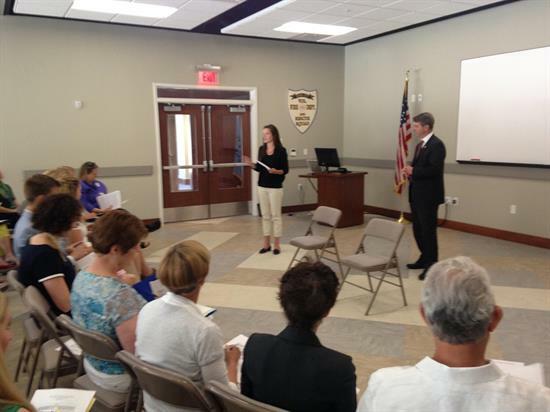 I spoke at the induction ceremony of the Phi Theta Kappa Honor Society at Rappahannock Community College. 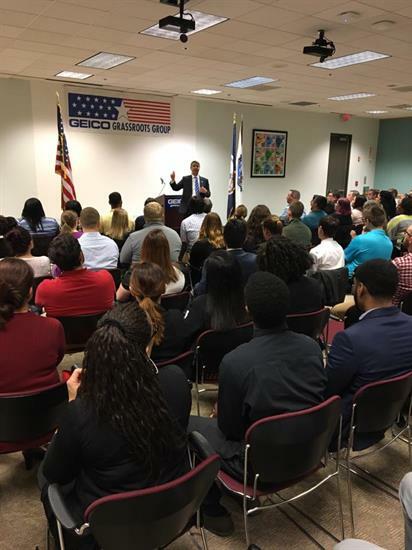 Afterwards, I talked with students about the different paths they can take to get the education they need, whether it be continuing to a four year institution, entering the work force, or learning a specific trade. I spent time last month with the groups that drive our economy. I first held a town hall with GEICO employees in Fredericksburg where we discussed the current state of affairs in Washington, ranging from the environment to health care (below). GEICO employs 2,300 people in VA-01. 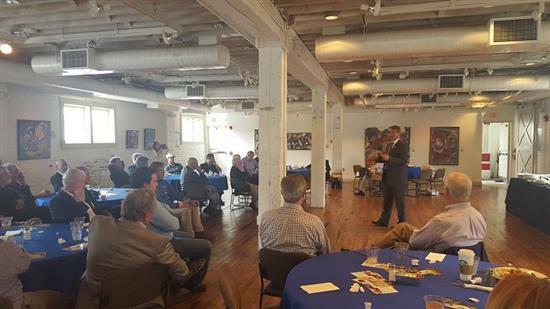 I met with members of the Fredericksburg Area Builder Association (FABA) to hear about their legislative priorities. 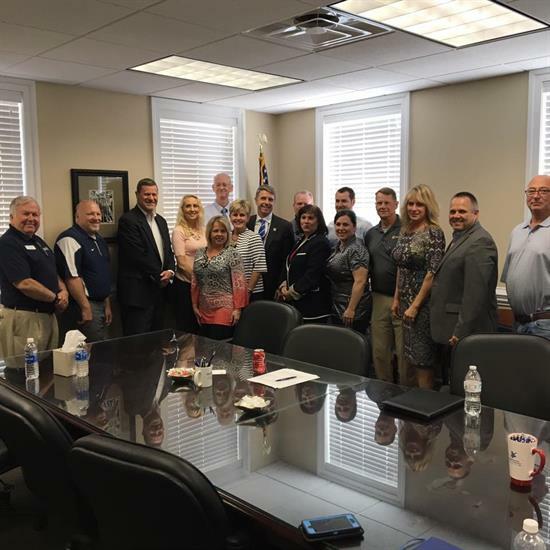 FABA represents thousands of people whose livelihoods are directly tied to the building and building-related industries and their feedback about reducing regulations on businesses was invaluable. 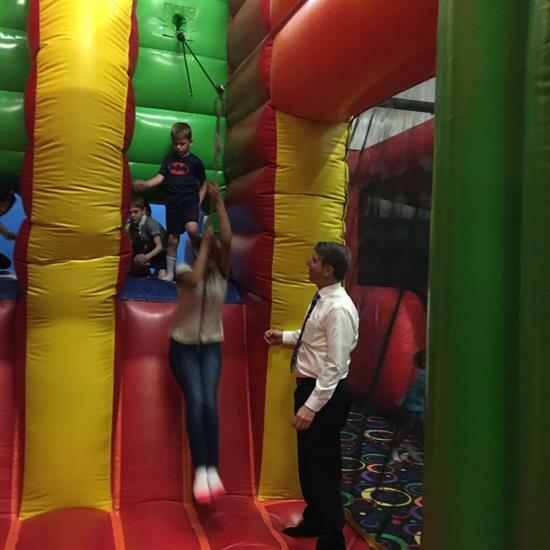 I visited KD Kidz World in Stafford, which is owned by Ian Denny, a Marine Corps veteran who served for 21 years. We talked about ways that Congress can help Veterans transition into civilian life, and how we can help our small businesses. I met with the Manassas Rotary Club for lunch to discuss pressing issues in Congress, like passing budgets and spending bills on time, ensuring we devote adequate funding to our national defense, and enacting health care reforms that will reduce costs and expand access to care. This is me visiting the Manassas Regional Airport, where I toured the businesses that support the airport. I saw first-hand what they need from me to support their small business. 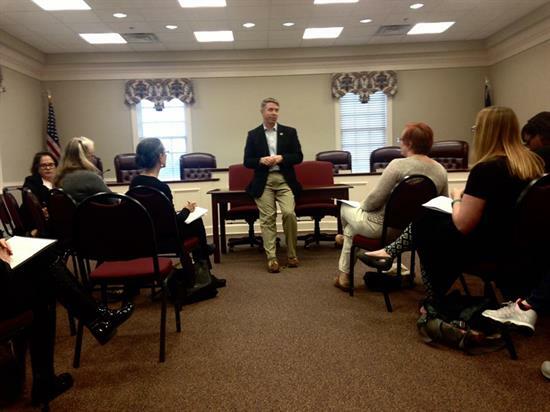 Meeting with our active duty and retired military is important to me as well. As I made my way around the district this month, I discussed with them the harmful effects of budgeting by continuing resolutions, and what I plan to do on the Seapower Subcommittee to ensure our Navy, Marine Corps, and Air Force have the resources they need to be successful. 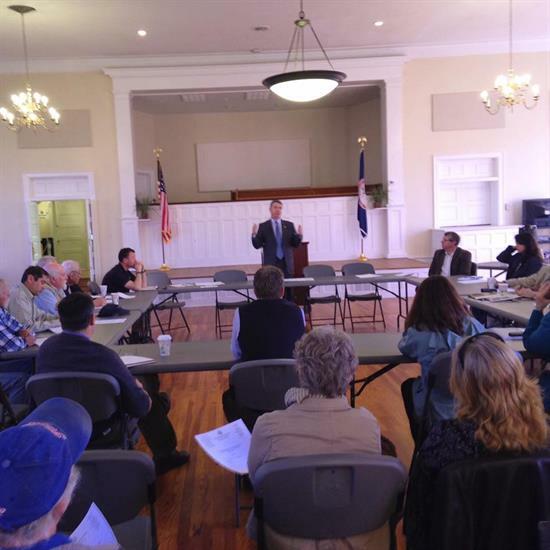 I visited with First District Veterans to hear what we can do to make sure they get the benefits they have earned. 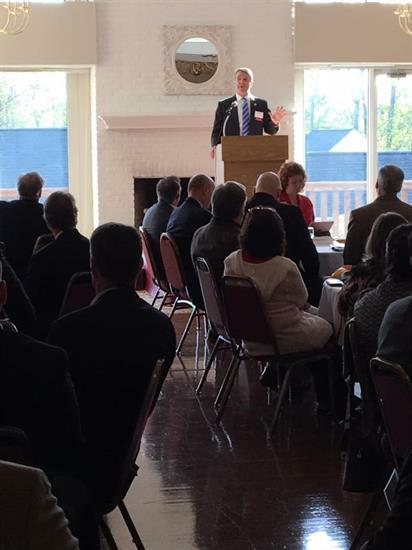 I attended the Fredericksburg Chamber of Commerce Defense Roundtable where I offered my perspective as Chairman of the Seapower and Projection Forces Subcommittee on the state of our military, the need to grow the Navy's Fleet, and the path toward improving military readiness. 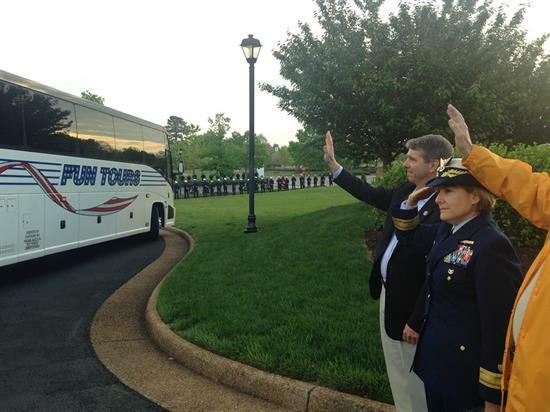 I attended the Honor Flight Mission 17 send off in Williamsburg. It was great to meet with our heroic World War II veterans as they prepared to visit the memorial in Washington. I discussed with the Veterans what needs to be done in Washington to make sure they receive the benefits they have earned. 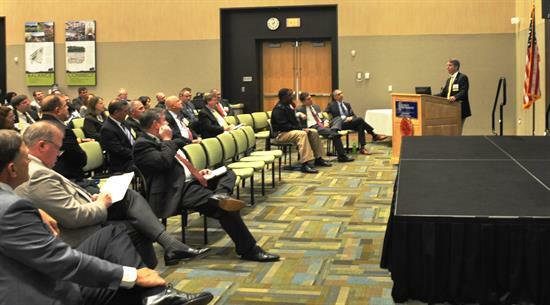 I spoke with constituents and industry experts at a workshop held by the American Society of Naval Engineers (ASNE) at the University of Mary Washington's Dahlgren Campus. ASNE is a professional engineering society for engineers, scientists and professionals who work behind the scenes to build and maintain naval and maritime ships, submarines, and aircraft. We discussed the path forward to reach a 355 ship Navy and the need to use our Navy to project force around the globe. 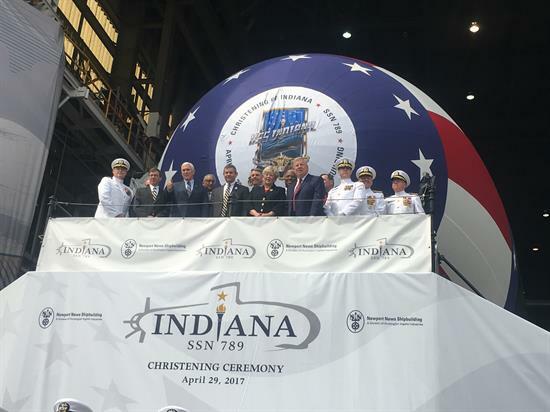 I attended the christening of the USS Indiana (SSN 789) on the last day of the month. Built by Virginia's own Newport News Shipbuilding, this Virginia-Class submarine will house over 120 officers and crew. I spoke with the crew and shipbuilders about ways I, as the Chairman of the Seapower and Projection Forces Subcommittee, can work with them to help meet our Nation's national security goals. This April we celebrated Chesapeake Bay Day! 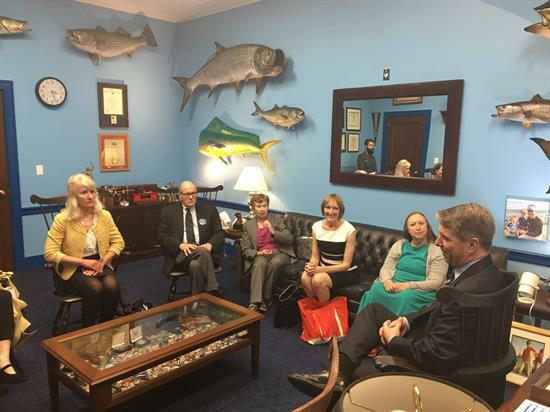 And as Co-Chair of the Congressional Chesapeake Bay Watershed Caucus, I met with groups in the district and D.C. to not only save and celebrate our Bay, but all of our natural resources in Virginia as well. I met with the Chesapeake Bay Foundation came to my DC office to share first-hand experiences and update me on local progress being made in regards to restoration efforts and the ongoing challenges that still lie ahead. This April I held a meeting with the First District Environmental Council. I got received feedback from experts in the area on what we should be working on in the House and discussed my work to protect our natural resources-specifically the Chesapeake Bay. 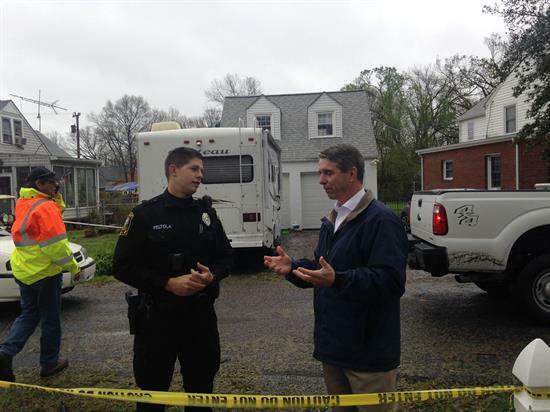 I visited areas of Colonial Beach to assess recent storm damage and speak with local officials about the cleanup efforts and how we can improve response times in the future. As part of my on-going health care listening tour, I met with constituents and industry professionals all over the district to hear their ideas on how to make our health care system work better for all. I visited with the Healthy Generations Area Agency on Aging at Shiloh Old Site Baptist Church in Fredericksburg. We talked about key priorities like funding for the Chesapeake Bay Program and ensuring programs upon which seniors rely, like Medicare and Social Security, remain solvent for decades to come. 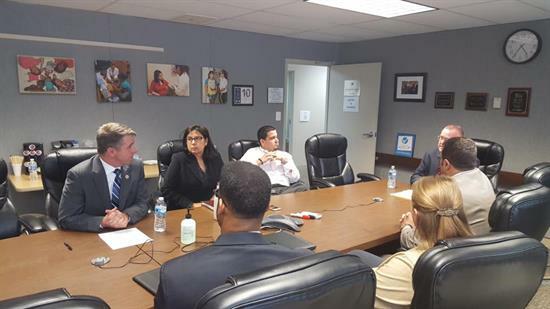 I met with staff at the Greater Prince William Community Health Center to hear about the care they provide as a Federally Qualified Health Center (FQHC). 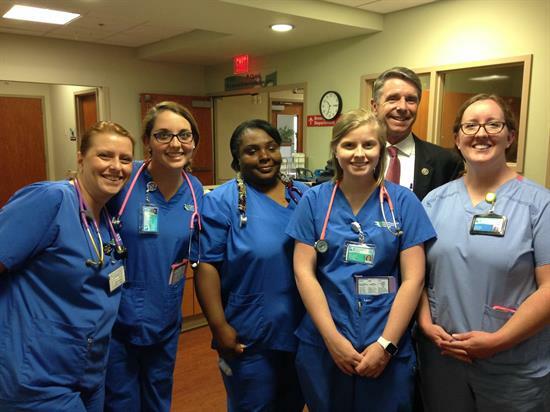 They provide primary, prenatal, dental and behavioral health care all under one roof, serving nearly 20,000 people in Prince William County. I also spoke with the staff about recent House actions to combat the opioid epidemic and ways we can address our nation's doctor shortage. Remember, you can share your thoughts and ideas with me and see the latest news on my work representing the First District by visiting my Facebook page, Twitter account, or Instagram feed. As always, I want to hear from you when issues that concern you come before Congress. You can send me an email by visiting my website. You can also sign up to participate in my telephone town hall meetings by clicking here. I look forward to hearing from you, and it's an honor to serve you and Virginia's First District in the People's House. *Please do not reply to this email, as that mailbox is unattended. To better serve the constituents of the First District I have established a contact form on my website. Please click here if you would like to send additional correspondence.